Thank you to Jasmin and Gigi of the Knitmore Girls Podcast for playing our promo! Jen went to the Huntington Botanical Gardens where she saw an amazing embroidery exhibit. She is also reading a book about Laurel Canyon called Laurel Canyon: The Inside Story of Rock-and-Roll’s Legendary Neighborhood. She is also preparing to play a gig at a fundraiser for Generations on the Move. Laura is getting new carpet in her house so she can set up a studio (woo!). She is busy with signups for Mean Girls Yarn Club. She also shares the exciting news that Dizzy Blonde Studios and Mad Color will be collaborating on a Buffy the Vampire and Angel themed yarn club. More information to come soon! Jen has been knitting on her Camp Loopy month 3 project, which is the Effervescence Cardigan by Olga Buraya-Kefelian, published in the Circles + Dots e-book by Quince and Company. She is using Madelinetosh Pashmina in the colorway Rainwater. She added short row bust darts, which is making the body take a long time. 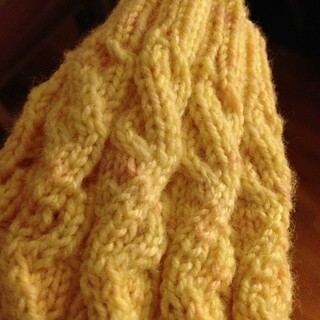 She is also using a tubular cast on and tubular bind off. She also swatched for Sthe Unique Sheep Watership Down Mystery Shawl Knitalong (but has not started the first clue) and is working on the gusset of her first Sunshine Sock by Cookie A, out of Dream in Color Smooshy in Butter Peeps. Laura is working on a Shepherd Book-inspired Mother Bear (Shepherd Bear) out of Berroco Comfort. She is changing some of the construction. Next up will be Malcubb Reynolds Mother Bear. (She is down to the wire with her Nerd Wars projects). We mention the Tempest Cardigan by Ann Weaver and the Knitpicks Brava yarn. 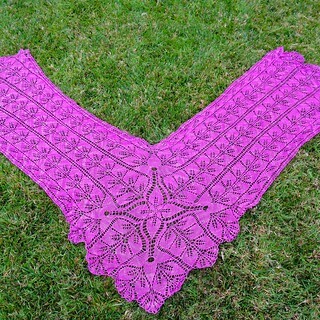 Jen finally finished her Madroña Shawl by Romi Hill out of Prism Delicato in Hibiscus. We talk about blocking lace without mercy. 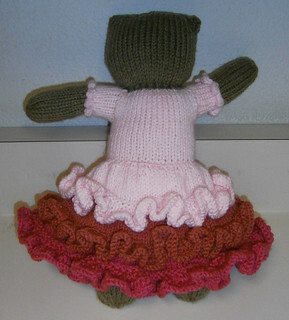 Laura finished her Koalee Frye Mother Bear. She did the layer cake dress, and she is debating whether she needs to add hair. Jen actually pulled out her Easy Baby Sweater out of Liberty Wool and picked up the second sleeve. Laura’s Kninja Kitty is in Devil’s Tower waiting to be stuffed. We mention OttLite for close work. Jen had to do repair work on a dropped stitch on her Sunshine Socks. 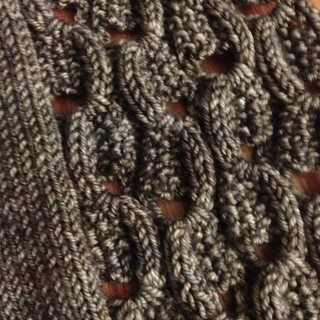 She also had to frog part of her Effervescence Cardigan because she neglected to do armhole shaping. Laura is going to cast on Entrechat by Lisa Chemery for her granddaughter. She also is going to start building an army of Minions (pattern by Lisa Potts). She is also planning on starting an Effortless Cardigan by Hannah Fettig. Jen is going to start the Rocky Coast Cardigan by Hannah Fettig out of Fibre Company Organik in the colorway Highlands (absolutely not Tidal). She really, really wants to knit a Princess Shawl by Sharon Miller. She’ll also be knitting the California Poppy Shawl in Baah La Jolla yarn, in the colorway California Poppy. We discuss the second challenge of the Fiber Factor. We mention the tutorial for handling fair isle floats by contestant Jodie Gordon Lucas and the Magic Knot Tutorial by Jane Richmond. Also we talk about the podcast Just One More Row. We invite your thoughts on the Fiber Factor; come talk on our Ravelry Group! We have an amazing interview with the incredibly talented Annie Modesitt. We discuss her latest book: History on Two Needles and also knitting terminology. She blows our mind. They have announced the casting of the Twelfth Doctor. Let us know what you think about the new Doctor. Also, Ron Glass will be in Agents of S.H.I.E.L.D. as a doctor. We want to hear your thoughts on this and all other news about the show. We also briefly mention Broadchurch. Is anyone else watching? KnitDizzney will be Sunday, September 8th, 2013 at Disneyland. We will be there from open to close. We will have a meetup at 2pm in the picnic area outside the Disneyland entrance; come say hi and get swag! We have pre-orders for both the custom yarn and T Shirts up! T-shirt orders are due by August 16th. We will both be at the CogKNITive Fiber Retreat in Tehachapi from the evening of October 11th to the morning of October 13. Dizzy Blonde will be a vendor and Jen will just be hanging out and taking classes. The retreat is full, but contact Dr. Gemma to be on the waiting list.